Say hello to your amazing new must have accessory designed by Sence Copenhagen. This new Urban Gipsy Bracelet is made using the finest genuine white leather and teamed with worn silver plating detail for a cool vibe. 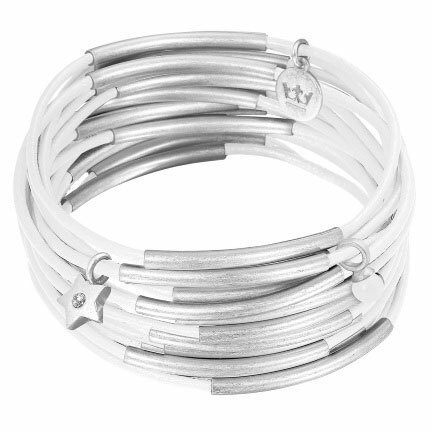 This bracelet features 15 really soft white leather bangles with worn silver detailing – perfect for wearing with your summer wardrobe. One of the bangles carries a small silver star charm with crystal, one with a white jade stone and and with the Sence Copenhagen crown logo on a silver disc charm to guarantee quality.